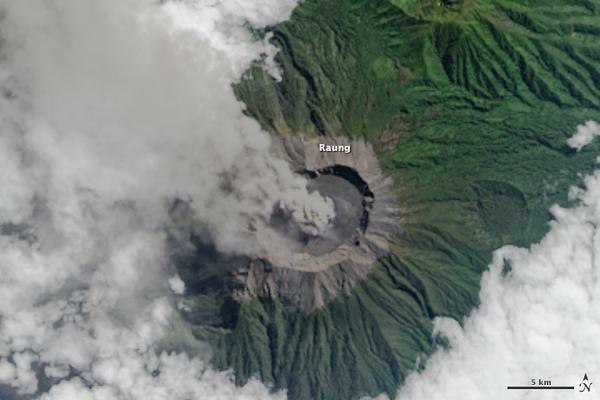 Raung (East Java): The eruption at the volcano remains very intense and might have increased during the past days. According to Indonesian press reports, new fissures have been reported (probably on the western flank) and incandescent ejecta were seen to up to a height of 1500 m. Some of them might have landed on the NE flank, where they probably caused a forest fire observed during 20-25 July. Sinabung (Sumatra, Indonesia): At least two pyroclastic flows occurred today at the volcano, continuing the destruction of the steeply emplaced lava lobes on the upper SE and E side. Our friends Samri and David reported heavy ash falls southeast of the volcano, forcing shops to close and people stay indoors.